Spoil moms with this special gift. 1. 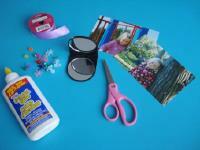 Gather your material. 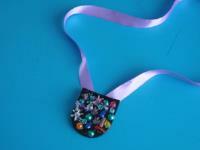 You will need a compact mirror, two pictures of the chid, scissors, colourful plastic beads and gems, a large hole-punch (not shown, optional), ribbon, white glue and/or hot glue. 2. 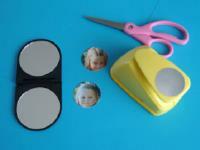 Using the hole-punch or scissors, cut around the contour of the child's face in both pictures. 3. 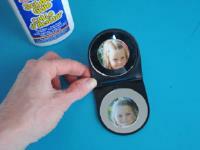 Glue one picture on the upper mirror and the other picture on the bottom mirror. 4. 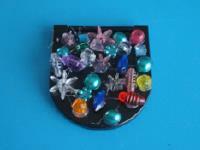 Glue beads and gems all over the external surface of the mirror. 5. 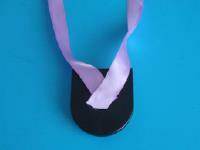 Glue the ribbon behind the mirror as shown. 6. 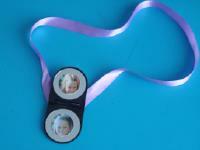 Offer this precious medallion for Mother's Day.